Although green tea has been in common use in the Chinese culture for many years, it has only relatively recently found its way into Western culture. Many Americans have learned to enjoy it and consider it beneficial. Along with acceptance have come many questions about green tea. Is it healthy is an important question. 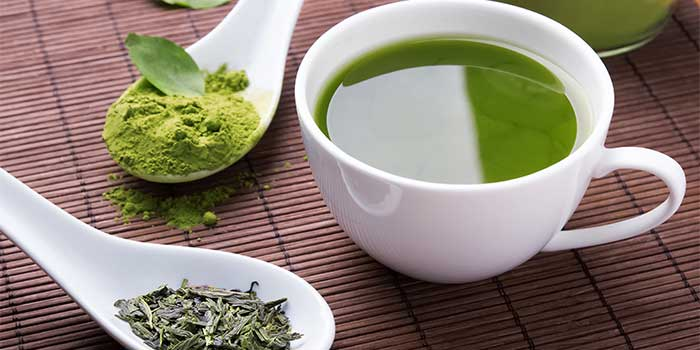 Is green tea alkaline or acidic?Should a person drink green tea if they have acid reflux? If you’ve ever had questions about green tea, read on. The plant Camellia Sinensis is where tea comes from, both black and green teas. Black tea is made when the tea leaves are dried and then crushed. The leaves are steamed and then dried to create green tea. Freshly brewed green tea is pretty much pH neutral and alkaline in nature. Generally, the pH value of green tea is 7.2. This makes it easier to digest than black tea or coffee, and also aids in food digestion when consumed after a meal. Bottled tea, however, is often acidic as it contains ascorbic acid or some other acidic preservative. Citrus juices are often added for flavor too, adding an acidic characteristic. So, is green tea acidic? Yes, it can be. Can Green Tea Help with Acid Reflux? Green tea is very rich in antioxidant polyphenols that aid in stimulating digestion and keep acid and undigested foods from backing up into the esophagus. So in this respect, green tea is beneficial for digestion and for soothing acid reflux. Green tea contains tannins, theobromine, and theophylline, which can help prevent heartburn. Green tea also has anti-inflammatory properties that bring relief to the burning sensation acid reflux causes. If the type you consume has added acids, then you probably shouldn’t drink it if you suffer from GERD. Gastroesophageal Reflux Disease, or GERD, is the complete name of acid reflux. It happens when acids in the stomach back up into the esophagus. Green tea contains methylxanthines that contribute to the relaxation of the lower esophageal sphincter muscles, which makes it easier for the stomach acid to enter the esophagus. Most of the studies related to green tea and GERD are inconclusive, with some showing acid reflux relief and some showing acid reflux aggravation. You will have to experiment to see how it affects you, if you deal with GERD. Your doctor will help you decide what is best for you. In all cases, it’s best to not drink green tea when your stomach is empty. Aid skin care and slow aging. May prevent some cancers, especially prostate, breast, and colorectal cancers. May prevent or slow neurodegenerative diseases such as Parkinson’s and Alzheimer’s. May prevent or slow flu and strep throat. Alleged to be heart healthy and aid the cardiovascular system. May boost metabolism resulting in fat burning. May increase insulin sensitivity and reduce blood sugar.